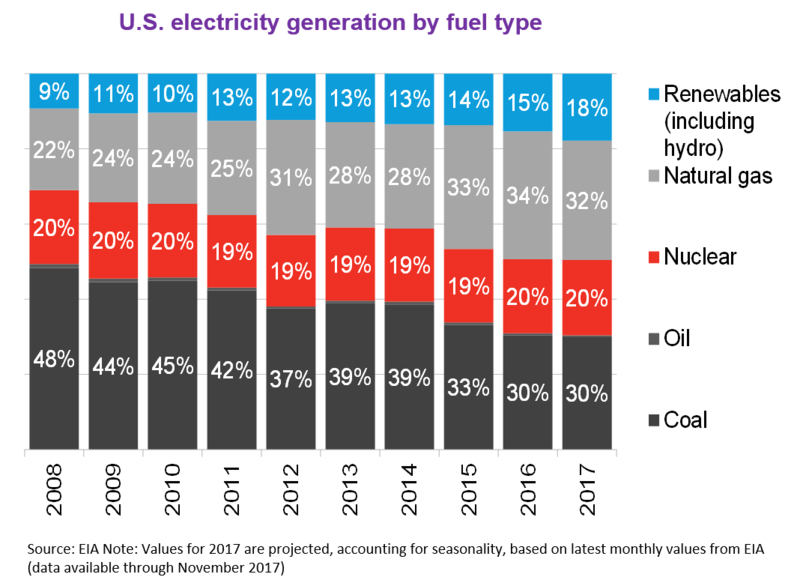 Today, the Business Council for Sustainable Energy (BCSE) and Bloomberg New Energy Finance (BNEF) released their 2018 “Sustainable Energy in America Factbook,” which quantifies power generation investments and production market share across the U.S., along with other noteworthy highlights. Reviewing the 2017 data, one quickly sees that advanced energy is booming, despite policy and market uncertainties on federal and state levels. Wind turbines convert the kinetic energy of wind into electricity. With more than 46,000 operating turbines totaling over 62 GW of wind capacity, the United States ranks first globally in wind power generation and second in installed capacity. Large-scale turbines typical of wind farms range in size from 100 kW to several MW each, while distributed wind turbines range from a few hundred watts to about 100 kW, and typically power homes, farms, or small businesses. The upwind three-blade design dominates the industry for large-scale wind, while some smaller turbines feature novel designs. Natural gas vehicles (NGVs) are internal combustion engine vehicles designed to run on either Compressed Natural Gas (CNG) or Liquefied Natural Gas (LNG). There are three basic categories of NGVs: dedicated, bi-fuel, and dual-fuel. Dedicated NGVs are the most efficient as they are designed from the ground up to run only on natural gas. In contrast, both bi-fuel and dual-fuel NGVs have two separate tanks, one for natural gas and another for diesel or gasoline. Bi-fuel NGVs can run on either natural gas or a petroleum fuel (either diesel or gasoline), switching automatically when one fuel runs out. Bi-fuel technology is typically used in light-duty vehicles. Dual-fuel NGVs run on a mixture of natural gas and diesel. They rely mostly on natural gas, but use a small amount of diesel to aid in fuel ignition. Dual-fuel NGVs are more expensive, but their higher efficiency makes them an attractive option for heavy-duty vehicles. Most NGVs rely on less-expensive CNG, but some vehicles used for long-haul trucking run on LNG because its higher energy density increases driving range. Geothermal power taps into the high-temperature hydrothermal resources of the earth to generate electricity. 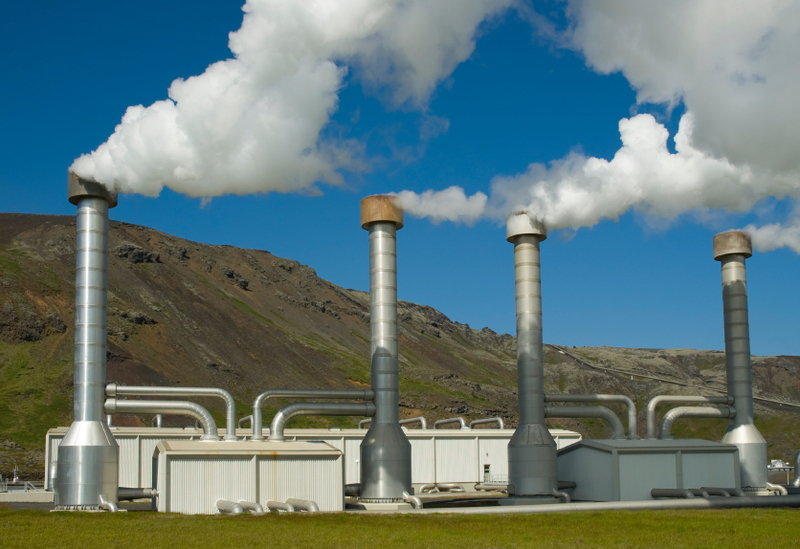 There are three main types of geothermal technologies: dry steam, ash steam, and binary. Dry steam plants withdraw steam directly to drive a turbine. Flash steam, the most common geothermal technology used today, pumps high-temperature geothermal fluids at high pressure into a low-pressure tank, which causes the fluids to vaporize (or “ ash”) so they can be used to drive a turbine. A binary cycle is a closed-loop process where low-temperature geothermal fluids are used to heat a second fluid with a low boiling point (e.g., refrigerants or propane), which in turn drives a turbine. Binary cycle power plants are expected to dominate future markets because low-temperature resources are more plentiful and generally easier to access.